Le Maki on 54 is situated in the prestigious suburb of Upper Houghton, in Johannesburg. 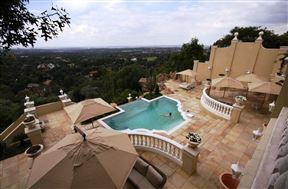 Overlooking the world&apos;s largest urban forest in Johannesburg is a rare and spectacular jewel, The Munro Boutique Hotel. Nestled in it&apos;s heart is a three story Victorian conservatory. Surrounded by waterfalls, exotic plants and panoramic views of our garden city.